Use this vanity to bring more traditional style into your bathroom. Made with a special black plywood base and a white marble counter, this piece will make your bathroom look even nicer. With a double-door cabinet, this vanity can hold all your bathroom must-haves. Make your bathroom look like new with this good-looking, useful set from Bellaterra. For some added modern style in your bathroom, choose this beautiful vanity. Its white marble counter and black mdf base will look beautiful in your home. Keep many bathroom items in its roomy drawers and single-door cabinet. Make your bathroom look like new with this good-looking, useful set from Bosconi. If you want a vanity that is both stylish and useful, this traditional vanity is perfect. Its drawers and roomy double-door cabinet are great to keep bathroom items in. This simple vanity set from Wyndham Collection will fit right into any bathroom decor. Andover 36-inch W 2-Door Freestanding Vanity in Black With Marble Top in White With Mirror This vanity has both an all-around look and a classic style. The white marble counter and black solid wood base make this piece great for any bathroom. The roomy double-door cabinet is great at storing your bathroom must-haves. Put a classic feel in your bathroom with this good-looking set from Wyndham Collection. 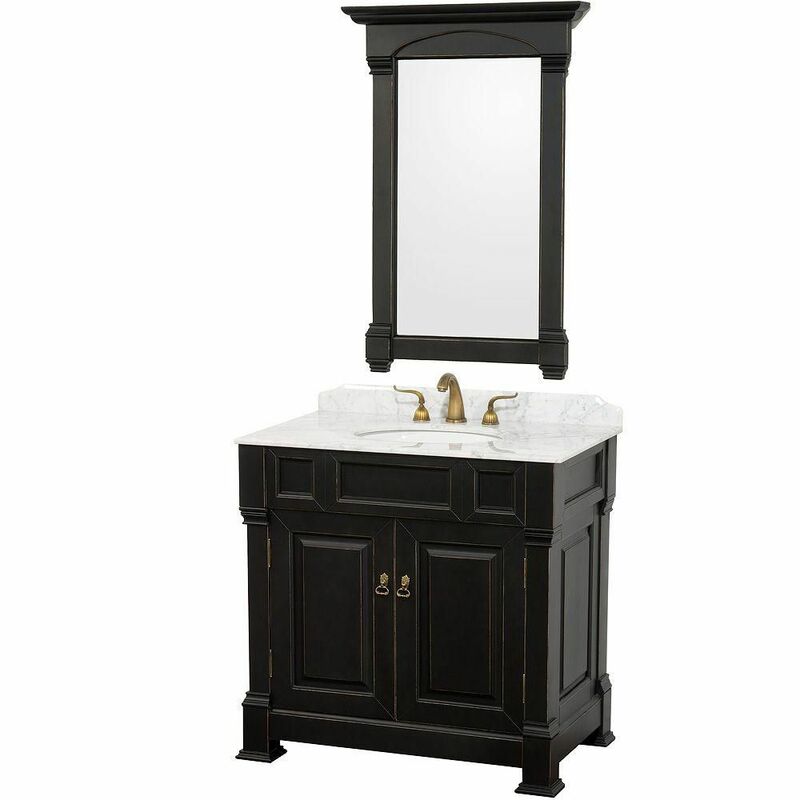 Andover 36-inch W 2-Door Freestanding Vanity in Black With Marble Top in White With Mirror is rated 4.4 out of 5 by 10. Rated 5 out of 5 by Ducks from Great value This unit arrived well packaged and strapped to a pallet, everything in excellent condition upon unpacking. I was very surprised at the quality. Looks fantastic........very happy with the purchase. The only thing I might mention is it doesn’t have any drawers. This is a feature I didn’t think to look for when purchasing. In the end it’s not an issue for me but might be for others. Again........very attractive and solid unit, very well packaged for delivery.